Born in Omaha, Dr. Kort Igel is a third generation dentist. Both his father and grandfather practiced general dentistry but Igel had other plans and decided to pursue orthodontics. He opened a small practice in Omaha once he had finished his orthodontics program at UNMC. Later he purchased a small, existing practice in Papillion. He said he and his team are also committed to offering their patients a comfortable experience. They accomplish this by giving each patient personal attention and a customized treatment plan. Igel said his team is friendly and professional and always work to provide the highest quality care. Igel and his team work hard to stay abreast of the latest trends in orthodontic technology. Igel’s investment in the iTero scanner allows for a digital impression of a patient’s mouth – which eliminates the need for a goopy impression. “Our younger patients benefit from early treatment with the goal of preventing impacted teeth, extractions and possible airway problems. We also offer ceramic brackets at no additional charge,” said Igel. Invisalign, a tooth straightening system, has become a favorite among both adults and teens. Other services include early treatment and airway conscious orthodontics, headgear-free appliances and an emphasis on non-extraction therapy. Igel said he’s not only concerned with the patient’s end result, but hopes to give his patients something to smile about throughout the entire process. He said his practice offers convenient appointment schedules, has two office locations, provides clarity and guidance regarding costs and payment options, as well as email and text reminders and hassle-free processing of insurance claims. “We also promote the importance of great oral hygiene throughout treatment by providing an Oral B electric toothbrush to all patients at the start of treatment and reward points for great oral hygiene and cooperation throughout treatment, which translates to awesome prizes,” said Igel. Dr. Nate Hawley joined Igel’s practice over the summer. Hawley graduated from the University of Kentucky with a Master’s Degree and Specialty Certificate in Orthodontics. 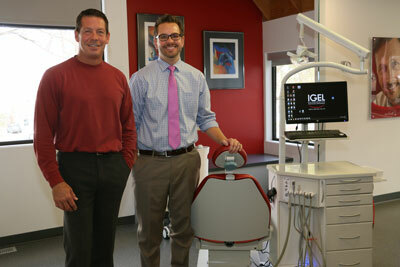 Igel said Hawley exemplifies everything people expect from IGEL Orthodontics. “Dr. Hawley’s treatment approaches and bedside manner go hand-in-hand with my methodologies of where our practice is heading,” Igel explained. With the addition of Dr. Hawley to the team, IGEL Orthodontics will offer additional appointment times at both their Omaha and Papillion office locations by seeing patients at both locations, Monday through Thursday from 7:30-5:30. Dr. Igel said he feels he has the best job in the world. For him, it’s rewarding to see the self-confidence and self-esteem in people that a beautiful, healthy smile can provide. Igel said he is excited and grateful to both his patients and the community for this honor. “Great treatment outcomes require terrific patients and a team that excels at both quality clinical skills and excellent customer service. I am grateful to have both,” he said. You can take a virtual tour at http://www.igelorthodontics.com. IGEL Orthodontics offers complimentary consultations so individuals can find out how they can achieve a healthier smile.